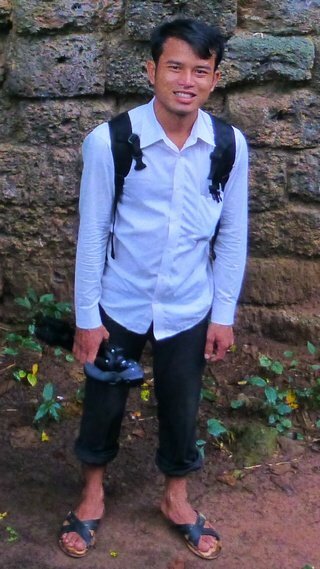 128 high-definition creative commons photographs from this remote Angkorian site in Cambodia, built outside of the main area, which is largely unrestored, together with further information and a plan. Like Angkor Thom, the temple of Banteay Chhmar was built during the reign of Jayavarman VII (r. 1181-c.1219) in the late 12th or early 13th century. One of the temple's shrines once held an image of Srindrakumara Rajaputra (the crown prince), probably a son of Jayavarman VII. It's remote location, 170 km northwest of the main Angkor sites (and now near the Thai border), may have been because the King's son died in battle at this place. The long Old Khmer inscription found at the site (K.227), and now on display in the National Museum, Phnom Penh, relates how this prince or a King (Samtac) was protected on two different occasions by four royal servants, all of whom lost their lives in his defense. The inscription lists the names of these officials and informs us that their respective images were once placed in the four corners of the shrine. 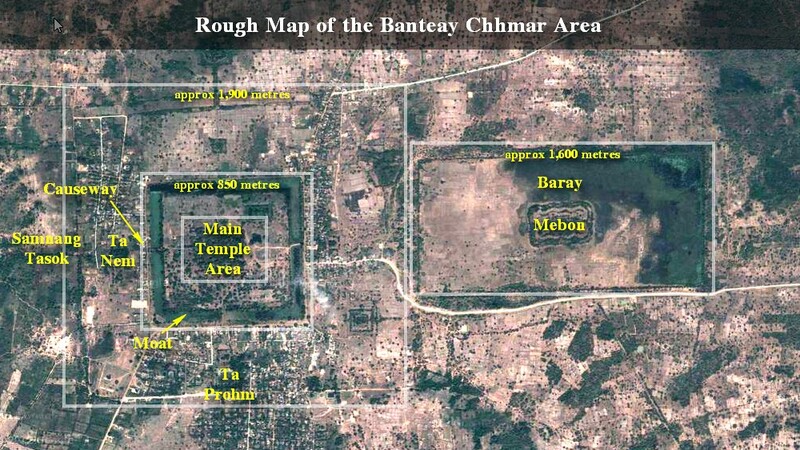 The complex resembles Angkor Thom and other structures attributed to Jayavarman VII. It is one of two sites outside Angkor with the enigmatic face-towers. It is believed that there were at least 50 facetowers originally, but most have now collapsed. The best ones I saw were actually at the satellite temples. The outer gallery of the temple is carved with bas-reliefs depicting military engagements and daily life scenes very similar to the well-known ones in Bayon, although around 75% of these relief walls have collapsed. They also have the famous Avalokiteshwara reliefs, which were originally eight in number, though owing to looters it appears now that only two remain in situ. The complex is oriented to the east, where there's a large dried-out baray (about 1.6 by 0.8 km), which had a temple on an artificial island (Mebon) in its centre, which was inaccessible when I was there. 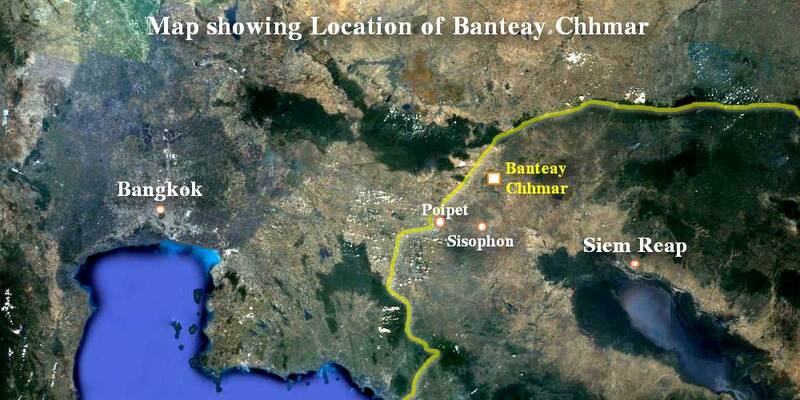 The baray served as a reservoir and irrigation source for the fields, and for maintaining fish stocks which were required to sustain the population needed to build and maintain the complex, which is estimated to have been around 100,000 people. There are three enclosures in the main temple, as is typical. The external one, largely ruined, was 1.9 by 1.7 km and surrounded by a moat. The middle enclosure, provided with a moat too, was 850 by 800 m. It contains the main temple, surrounded by a gallery with reliefs 250 by 200 m which constitutes the third inner enclosure. Besides the main temple and the Mebon there are other eight secondary temples, most of which are quite difficult to access, but thanks to our guide, Sopheng Khlout, we were able to locate and photograph at three of them: Ta Prohm, the easiest of find, has fine facetowers in a scenic setting; Ta Nem, rather harder to find and photograph; and Samnang Tasok, which is hidden away. The satellite temples appear to be quite neglected and when we asked if there were plans for their preservation we were told that at present there were not. Four stelae detailing Jayavarman VII's genealogy were placed at each of the four corners of the third enclosure wall (though they remain unfinished), mirroring the stelae that occupied the four corner-shrines (Prasat Chrung) of the king's capital at Angkor Thom.